It was only a matter of time before someone made a film of The Fellowship of the Ring, J.R. Tolkien’s first book of the The Lord of the Rings trilogy. The story is a masterpiece. The characters each have their own plight and rite of passage. The conflict and journey are epic. But it’s a slippery slope to try and adapt a timeless story such as this for the big screen. To quote a character from the story, “Stray but a little and you will fail.” Fortunately, Tolkien proves to be a wonderful guide in his wizardry and craft, and paved a clear path for director Peter Jackson and screen writer Fran Walsh. All they had to do was follow the map. It should be noted that Tolkien did not completely render every nook and cranny of his saga. To detail every hillside or facial feature of characters or elven craftsmanship in their weapons would have taken a lifetime-and he had bills to pay. Rather, he used broad strokes for such things, letting the reader fill in the gaps. This is where the movie comes into play, and for the most part movie is a wonderful compliment to the book. To go one step further, the screen writer did a wonderful job of creating little scenes here and there that reward the Tolkien fan club. For instance, we find the main character, Frodo (Elijah Wood) and his companions sitting under what looks to be monsters carved into stone. These statues, however, are actually a trolls turned to stone in the saga’s prequel, The Hobbit. But, for every nuance added, there was one taken away. Tolkien had a wild imagination and a classic style. So, when the journey sets out, it passes through several common scenarios that we see in many stories, but with Tolkien’s fantastical flair. The Lord of the Rings is a fantasy sci-fi story at heart, but Tolkien at times may have gone too far for the average movie-goer. For example, Frodo quickly finds that he is being chased along his journey, and flees to a dark, treacherous forest-which is a standard writer’s tool for confusion and/or evil (classic style). 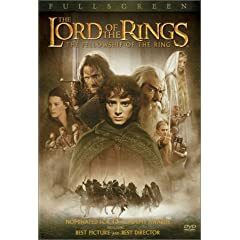 While traveling through the Old Forest, Frodo and his hobbit companions are entranced and Sam Gamgee (Sean Astin) and Pippin (Billy Boyd) are engulfed by a carnivorous tree (enter Tolkien’s imagination). But a man-of-the-wood named Tom Bombadil beats the tree with the power of song. The movie skips over the perils of the Old Forest entirely. But, I can see how the director might foresee the average audience finding a hobbit-eating tree bested by a singing, skipping woodlander a bit too much sci-fi. Instead Jackson simplified the formula: Sauron, Ringwraiths and orcs are the bad guys; hobbits, humans, elves, dwarfs are the good guys. To expand on the concept of eliminating songs from the movie, there are many poems and songs excluded from the movie. In practically every chapter of The Fellowship of the Ring someone’s singing an old story or working on a new lyric. It’s not surprising that they were left out, though, as the movie has to keep its mainstream appeal, and people probably wouldn’t care much to hear the actors’ vocals. Unfortunately, stripping the movie of songs and rhymes leads to several scene changes, and some interesting lore. None of the “filler” for the missing songs damage the story, and they fit well enough with the journey’s flow. The book is also far less violent and alludes to conflict much more than it embeds the audience in it. The wizard battle between Gandalf (Ian McKellen) and Saruman (Christopher Lee) in the tower Isengard is an exaggerated version of Gandalf and Saruman’s quarrel and Gandalf’s capture. Also, how Gandalf escapes is twisted to eliminate the introduction of another character (a beast-master wizard named Radagast). In the climax of the movie a final battle on the hillside of Amon Hen claims the life of Boromir (Sean Bean) in a valant effort to regain his honor in sacrificing his life for the sake of his hobbit companions. Meanwhile, Frodo and Sam flee the fellowship to seek their fate alone. In the book Tolkien leaves us with only Frodo’s path, as Boromir’s final stand is not revealed yet. The movie provides a rewarding climax, however, and it is not totally unfounded. The second book, The Two Towers, records the battle on Amon Hen. Aragorn (Viggo Mortensen), a classic hero character, is a lost hero looking for strength within. Tolkien gives us a glimpse of Aragorn’s impotence and refusal to lead, but in the movie he is much quicker to grow into the leader. The biggest change for Aragorn, in my opinion, is Anduril, his sword and heirloom. In the book, he carries a broken hilt in his sheath. This is the heirloom that he seeks to remake one day upon the rise of the human race, and it is remade into Anduril, the blade that defeated the evil Sauron in the Battle for Middle-Earth. In the movie, the sword is found in the elven city Rivendell, where it lays broken in shards. The movie couldn’t afford to have Aragorn not fighting, so he needed to have some sword, if not the mythical Anduril-but in the book he has no need for a sword as of yet. The battle with the Nine Ringwraiths on Weathertop is one of the few instances where he fights for his companions, he used torches-but in the movie he used torch and blade. The movie makes way for a strong female character and love interest, in yet another attempt to create a blockbuster event out of Tolkien’s Lord of the Rings saga. Arwen (Liv Tyler) saves Frodo from certain doom on the way to Rivendell. With her aid the Ringwraiths are washed away in a flood she commanded with her elf craft, and Frodo is healed by the elf elder, Elrond (Hugo Weaving). While Frodo heals, Aragorn and Arwen share moments of forsaken love between human and elf, but in the book they hardly speak. Rather an elf named Glorfindel saves Frodo and his horse rides Frodo across to safety where Elrond and Gandalf create the flood. But, there’s always room for romance, even if a little re-writing is in order. In a funny way, you could say that Samwise Gamgee (Sean Astin) and Frodo are also a couple. Sam is bound to Frodo as his servant. In the book their relationship is much like this: Sam calls Frodo master regularly and follows him with the loyalty of a dog. In the movie they make sure to not use the word master, and replace the servant-master relationship with one of love and commitment. Whether or not all the little changes add up and destroy the book’s foundation, or if you believe that taking something old and making something new is the best way to treat Tolkien’s classic, the movie does do most of the book justice. Gandalf’s final battle, the temptation of Galadriel (Cate Blanchett), personification of the One Ring, Bilbo’s (Ian Holm) corruption, and countless other parts of the book are represented with outstanding accuracy. 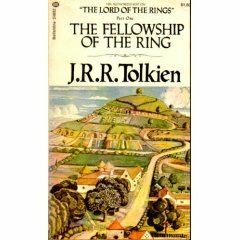 Unfortunately, a lot of back story and references to the prequel, The Hobbit are lost, but as a whole it is a testament to the book.